If you have been following this blog for a while, you will probably have guessed that I will be choosing ETFs for my tax free savings account. I’m quite predictable, I know hey. I have a bit of an obsession with the Exchange Traded Funds and have written about them quite a bit in this blog especially when I was giving investing advise to teenagers, to those in their 20s and general information to those who email me questions. The ETFs remain the best choice for those who prefer to take a less hands on approach to equities investing. There are a number of ways that one can use to take advantage of the new tax free savings. I cannot have been the only one who patiently waited to see if the exchange traded funds will be suited to the tax free savings account. How delighted I was to read that all institutions that have a banking or collective investment scheme license will be eligible to offer products through this tax free savings or investment account. This benefit is actually even extended to stockbrokers that are registered with the Financial Services Board (FSB) and the Johannesburg Stock Exchange (JSE). In all, almost all certified financial service providers can easily offer products that exploit this great benefit. Most will agree that R30,000 R33,000 per year (maximum) is quite a lot of money to be saved in a low performing savings account. Ag, any amount of money should be invested where it attracts a decent amount of interest. I definitely think my R33,000 would be better off invested in the ETF or a combination of ETFs than in most savings accounts that are in existence. That's the reason that I am choosing ETFs for my tax free savings account. 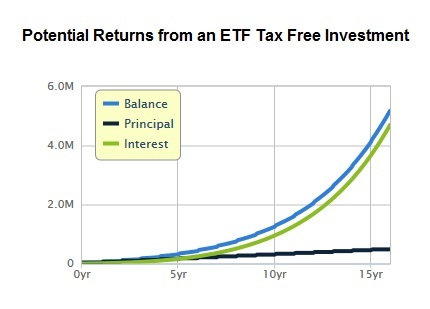 Below is a little exercise to see how one can potentially gain in the ETF investment with this generous tax benefit. NB: the exercise is based on the initial tax free account annual allowance of R30,000. This has been increased to R33,000 from March 2017. I am using 25% return. (The ETF that my son is currently using averaged 27.67% per year over 5 years and around 30% during my son's investment period). I know, this looks a bit far-fetched. Well it may be a bit optimistic but it is possible to turn R480,000 to R5 Million in less than two decades (keeping all other things equal). Even more awesome is the fact that dividends and capital gains will attract no income tax, no dividends withholding tax and definitely no capital gains tax. Double check with the financial service provider that your investment product of choice qualifies to be one of the tax free savings accounts. Typical accounts that qualify include the collective investment schemes, bank savings accounts, fixed deposits, retail savings bonds, REITs, etc. National Treasury did confirm that most exchange traded funds (ETFs) do qualify. However, direct share purchases do not qualify. Exceeding the yearly contribution of R33,000 (current limit in 2017) will attract the tax on the amount above the limit. The R33,000 yearly and R500,000 lifetime contribution may be reviewed and adjusted based on affordability conditions and inflation. Withdrawals are discouraged and cannot be re-invested. This results in the tax benefit being forfeited. Both your service provider and yourself will be required to do annual reporting through SARS annual returns in the section under the income earned in the tax free account and declared as non-taxable income. It has been a hectic few months. Exciting times ahead. I will be renovating a multi-family property soon. I will let you in on the ups and downs of acquiring this property.